Great hall... wrong location. Needs to be near the "cultural boulevards"
Methinks it would be very suitable for the old RAH site on North Terrace. Now you're playing with power. Except few in the music arts community want a concert hall on the old RAH site, hence the ASO's lack of support for the idea. But let's face it, it's bureaucrats who will make that decision and then expect the ASO and its following to be grateful. Where do they want it built then? Originally, on the site of the Festival Plaza. They have a few ideal locations, their latest plan was either the Sir Samuel Way Building or atop the Market Precinct. ACC may yet get its wish. Last edited by ChillyPhilly on Thu May 10, 2018 10:17 pm, edited 1 time in total. FFS, and how many of you said that this site falling into ACC hands was a good thing? If this becomes a carpark, it will never change from that. Does anyone know the height limit for the area? It'd be a fantastic spot for a tall tower, except that it is almost exactly under the straight approach path to the main runway. A tall tower will NEVER be built in North Adelaide. A few updates on here. I recommend clicking the links on the right hand side, in particular the Community Engagement Report. TENSION is brewing between Adelaide councillors over plans to develop the former Le Cornu site in North Adelaide, amid claims the land is being used as a political football. After buying the O’Connell St site for $34 million, the council released a draft of guiding principles for its development, with a preference for an eight-storey residential block with multiple small shops. But North Ward councillor Phillip Martin is arguing the development should be restricted to only four storeys. Cr Martin has dropped leaflets to local residents saying the decision made at a confidential session to allow eight storeys was not in line with community consultation. But councillor Houssam Abiad says Cr Martin could put a “handbrake” on the economic benefits to North Adelaide by arguing the development should be restricted to only four storeys. Lord Mayor Martin Haese said building heights from four storeys to 20 storeys were suggested at the community consultation, and council made a “conservative and responsible” decision. “A medium density development is the right use of ratepayer funds,” he said. 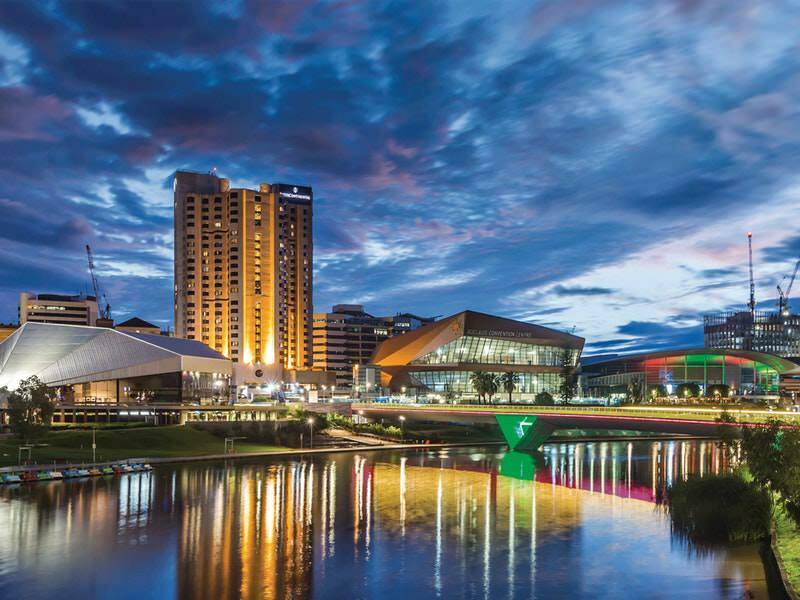 “There is a very strong argument to suggest that a considerably lower development would breach our fiduciary responsibility to our ratepayers to get a return on this. “We don’t want this very key project to be frustrated by politically motivated shenanigans.” Cr Abiad said four storeys would be a “handbrake” on North Adelaide. “I would argue that he is playing a political game and representing an extreme minority view,” he said. But Cr Martin said other elected members were playing politics trying to rush through a development on the Le Cornu site before the election — and said it should be an issue for the next council. “The fence at 88 O’Connell may have come down but a veil of secrecy has been drawn over what will happen there,” he said. “There have been confidential meetings where Councillors have been presented with inadequate information and modelling which has not been subjected to independent review. At a council meeting on Tuesday, a discussion was held for the land to be used as a temporary carpark for sporting and community events. 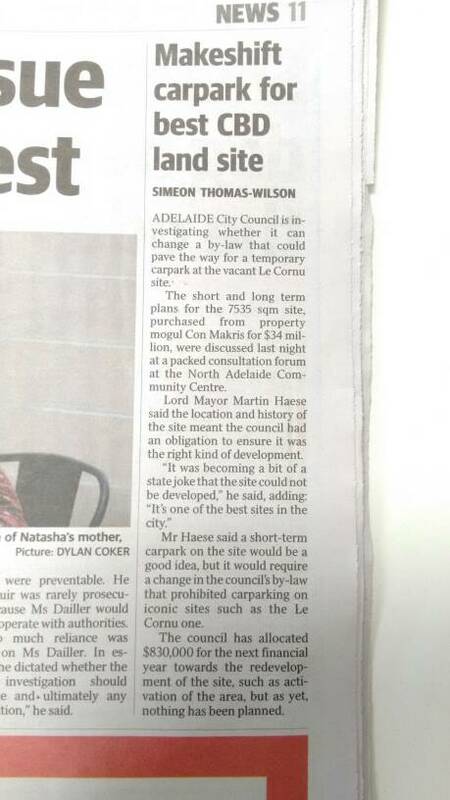 As I read somewhere recently: the Le Cornu site is fast becoming Adelaide's next Le Cornu site. Seriously, I have become apathetic to this cause. It's the best example of Bureaucratic ridiculousness and bad developers. I have gotten to the point where I actually wouldn't mind if it became a park. At least it would be a commitment. There is an election later this year. Absolutely zero chance anything will get agreed before Council goes into caretaker mode. Under the tenders section in The Advertiser the ACC were seeking tenders for real estate services/agent for the 88 O'Connell St site. I expect they will appoint an commercial agent to advise on how best to handle the development and/or sale. I think the ACC will put in place guidelines/policies/covenants on what they want built [if they can agree] and then offer the site for sale either in parts and/or a whole by tender to the open market. Unfortunately when it comes to anything in North Adelaide, the ACC won't agree. That's why the State Government made sure the ACC had no responsibility in Adelaide Oval or the footbridge. I can't recall there even being a significant project in North Adelaide in the past 20 years that the ACC have been put in charge of and successfully completed. If anyone can think of one, feel free to inform me.